Yes you can. I know because I have one in my UK spec TT auto diff. This is the big 220mm diff with 3.538:1 ratio. As far as I know you can buy a TRD LSD for both the small and big diffs (make sure you buy the correct one for your diff) and they will fit in to all the mkiv Supra diffs. do you know the part # for the trd lsd for the 200mm differential (v161)? i have been looking everywhere but cant find anywhere to buy it. Curt at Elmhurst Toyota sells the TRD LSD's. V8KILR - Precision 6870 AR 0.81, SPA manifold, 4" down/mid pipe, 3.5" AdrenalinR mufflers, Link G4, E85, 760whp @ 26psi (Dyno Torque), Getrag 6 spd, 10.94 @ 130 mph (19 psi low boost run as no cage). Owned and raced since Feb 1998. Does anyone know what diffs need this mod? PS: if this shouldn't even be in this thread please let me know and I'll try to have it deleted from here and moved to another thread about LSD diffs. Nick, thanks for posting this as this is good info! Long story short, the actual axle stubs that Toyota used with these differentials have a surprising amount of variety, considering the consistencies everywhere else in the car. For instance, when installing a clutch type LSD in a Supra or Soarer that came with the 200mm diff and a factory LSD, the axle stubs from LSD-equipped cars are slightly too long for a proper fit with a TRD or other clutch type LSD. For the most part, this is usually taken up by tolerance creep between parts and no problems are experienced, and the tension from the installed axle halfshafts themselves usually keeps the axle stubs in place, but this sometimes becomes problematic when wheelhop, etc, is experienced and the axle stubs actually pop out just enough to induce a gear oil leak, and because of that possibility, many LSD makers list a need for the factory Toyota OPEN differential axle stubs to be used when installing a clutch type LSD. Since the 220mm diff as found in the pre-'minor change' JDM 6-spd TT models (which includes ALL of the US TT 6-spd's and European delivered TT big diff vehicles, I should mention) always came with a Torsen LSD, the axle stubs are also slightly longer than would be used with most clutch type LSD's. 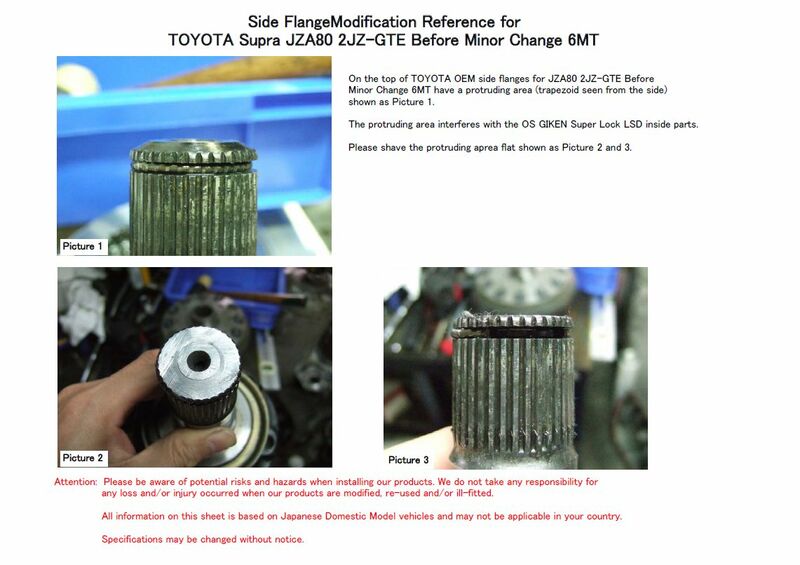 The TRD LSD was probably designed to accommodate those stock axles, but because of possible fitment issues, OS Giken has published this just in case a tolerance issue arises and those axles have occasion or cause to pop out under wheelhop conditions, etc. As long as your LSD is working normally and no leaks or problems with the axle stubs popping out has been experienced, I'd say you're probably just fine. But if you go back into the diff for any other reason, probably wouldn't be a bad idea to take the stubs to get milled down as shown in the pics to ensure that it never becomes a problem later on. If you've got a clutch type LSD in a 220mm diff, and you're experiencing an issue where the axle stubs pop out after hard launches, high speed pulls, or after wheelhop, and thus cause an oil leak, pull both axle stubs and have them milled in accordance with the pictures. The TRD LSD was probably designed to accommodate the stock axle stubs though. If you're installing an OS Giken Super lock into a 220mm diff, you might as well have your axles modified 'while you're in there' during the installation. The modified axles will not affect the stock torsen LSD should you chose to revert to the OEM Torsen for any reason. ^ Thanks a lot, Jeff. My Super Lock has been in there for several thousand miles and a few track days with no issues, leaks, or noises, so I feel pretty good that all is fine. But I'll make it a point to do an inspection sometime soon. I'll report back in this thread for the record. Thanks for posting this and getting the ball rolling! Thanks for the certification as I located this tech article when doing some research on the LSD as I’m undecided between the OS Giken Super Lock and a Carbonetic LSD. I guess this condition will apply to any clutch type LSD and now I’m wondering if this clearance issue will apply to the Carbonetic as well. Hopefully others will see this and chime in with their experience. Although, if this was a common occurrence we’d have seen someone’s posting before now. I'm glad you saw this and thanks for bringing our attention to that Giken tech note. Since my Super Lock is working perfectly, making no noises, and no leaks at all for several thousand street miles and a few track days, it minimizes my concern about a clearance problem. In any case, sometime in the near future I'll have it opened and inspected and report back here. I am trying to identify what differential this is. Can anyone help? I am having the guy get the part number off of it, but I was curious if anyone can tell me from these photos. The ring gear has 000-6y00103 on it. I am confused because from what I read, a 10 bolt is an NA differential pumpkin, however it looks like this one actually has an LSD vs an open differential to my eye. I have to drive a distance to get it, so I would rather know before hand if it is an LSD diff than getting there and spinning it and seeing its open. Any help is appreciated. The NA's and TT Autos had the same carrier and 10 bolt ring gear aka 200mm housing aka 'small diff' so all we know from it being a 10-bolt is that it isn't from an export TT 6-spd or early JDM TT 6-spd. The finned housing tells us it probably came from a JZA80 Supra or a JZZ30/UZZ30 Soarer, as GS400 and later Aristo pumpkins were smooth. Have the seller or whoever has this diff rotate the axles until the pinion gears of the differential are visible. From that angle it looks like an open diff to me but there's no way to tell, and I suspect the seller probably knows that. Have the seller count the teeth on the ring gear and you can use that number to cross reference the ratio charts on the first pages of this sticky so you can narrow down the potential vehicles it came from, and make your own decision on whether or not it might be an LSD from there. Will LS400 diff work too? If I have the JDM 200mm Diff with the subframe and axles attached, then bought a US Spec 220mm, do I need to also buy L/R axles too? Maybe I should just buy an Auto clutch diff and live with the 200mm? BEP374R FTMFW! 690WHP/620WTQ @ 22.5 PSI E85 - 198K Miles on the motor! Is this a TT diff? Its not the big diff, but it could be from a TT auto or post May 96 JDM TT 6 speed. Check the ratios to find out and open the back to see if its a torsen diff. Last edited by 360rwkw; 10-11-2013 at 04:50 PM. Doing the 6 speed swap in my 93 TT auto and recently purchased (from what i was told) a US spec TT 6 spd diff. Before i go through the process of installing is there anything i should or could look for on the diff to confirm which it is? All i can tell from the outside is it does have the cooling ears on the cover and the cover has never been removed. also when taking both output axle flanges and turning them in the same direction the pinion flange turns. If it has the cooling ears then it is the big torsen diff. Could be US or JDM diff, but ratios are very similar so that will not matter. Yeah looking at it and reading the swap page. It is longer front to rear than the auto diff and the left side sticks out more as well. Anyone try 2.937 raito from Lexus IS-F? I haven't been able to get eyes on an IS-F diff with the cover plate removed to see if it'd swap into either the large or small Supra diff. I know the cover plate is very different from any Supra designs but the diff carriers themselves look VERY similar to the Supra/SC/GS pattern diffs. Of particular note is that the IS350 diff seems very similar in size to a 200mm TT auto diff, and even the casing bears a very strong resemblance to the 200mm carriers found in Lexus SC's and GS's. The IS-F diff seems to be a bit larger, and somewhat similar to that of a 220mm diff pattern, but I've also read about IS-F guys swapping to an IS350 diff for shorter gearing without changing the axles or driveshaft or anything else. So the actual sizing and its potential compatibility in a Supra is still something of a mystery. If I get a chance to snag an IS350 diff for cheap, I might do that just for the sake of research, and investigate IS-F compatibility from there. In the meantime, anyone that happens to have a Supra and an IS-F and wants to drop both differentials for an experiment over the weekend, and take pictures & measure accordingly, I'd love to see that info, and I'd update this sticky accordingly. Wow lots of great info here. I was out looking at a local guys Toyota parts for sale and he had a torsen LSD. Said it was for a supra. Took a chance and brought it home. Didn't have time to research it. Well, come to find out thanks to this thread.. its an LSD for a 6 speed and will not fit in my SC300 diff case. I did learn about the 12 bolt vs the 10. Question is, will this LSD fit anything else besides the larger 6speed diff? Did I buy a cool looking paper weight? ?